An Ayurvedic Consultation will guide you to make simple and manageable changes to your diet and lifestyle to increase your energy, bring emotions into balance and keep your mind clear and focused. Bloating & wind? Low energy? Feeling hot & irritable? Acid Digestion? Aches and pains, stiff joints? These are some of the first signs that things may be out of balance. Your state of health can also be a wake up call if you’re not really happy with aspects of your life. The support of an Ayurvedic Practitioner can help you get back on track so that you can experience increases in energy and a greater sense of well-being. Ayurvedic herbs and treatments can be used to enhance healing, shift deeper issues and bring quicker results. 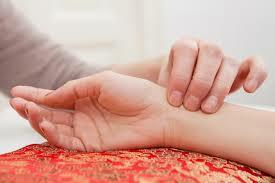 Consultations begin with a pulse reading to establish your current state of health. Pulse reading is best carried out on an empty stomach, so you will be asked not to eat for 3 hours before your consultation. “I was diagnosed with rheumatoid arthritis at the beginning of May this year; it was very uncomfortable to walk and my left arm and hand throbbed constantly and were extremely painful when moved. I was kept awake at night by the pain. I had my first consultation with Julie Ulbricht in the middle of May and was put on a diet which, together with different herbal remedies, had an almost immediate effect. Now, two months later, I can walk for hours without discomfort, I have no pain in my arm or hand and the hand is now restored to full movement and its strength has substantially returned.